This is Jed's Island Resort. There are many places in the Philippines to unwind in the sun. There is only one resort with a DoTA Tauren Chieftain statue. Since 1995, Jed's Island Resort has been severing vacationers in the province of Bulacan. 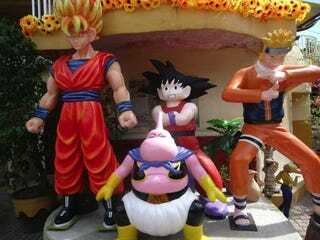 The resort continually rotates out new statues that are often video game, anime, or manga themed as well as ones inspired by American comic book and cartoon characters. Some of the statues look okay—if not, cool. But many are—how to put this politely—lacking. But that's, perhaps, part of the charm. And I'm not sure Jed's Island Resort has gotten the rights to use these characters, but let's hope so. Via the resort's Facebook page, here's a look at the good, bad, and ugly statues the Jed's Island has showcased over the years.